PRINCESS Eugenie's engagement announcement caused a right royal stir - and so did her unusual ring. The pink padparadscha sapphire, surrounded by diamonds, is similar in style to the ruby engagement ring her dad, Prince Andrew, gave to Sarah Ferguson when he proposed in 1986. Eugenie, 27, announced she would wed James Brooksbank in the UK autumn in the same Windsor venue that will see Prince Harry and Meghan Markle tie the knot in May. Princess Eugenie shows off her engagement ring. But that doesn't mean she'll be overshadowed by the wedding of the year - and the price of her sparkler proves it. The gem expert from UK TV show Posh Pawn has estimated the value of Eugenie's ring at £100,000 ($A175,112) - and that's double the estimated value of Meghan's. 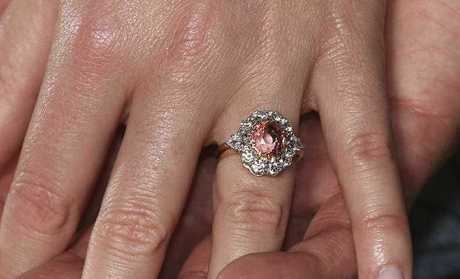 The three-diamond ring Prince Harry's fiance wears is estimated to be worth around £50,000 ($A87,556). 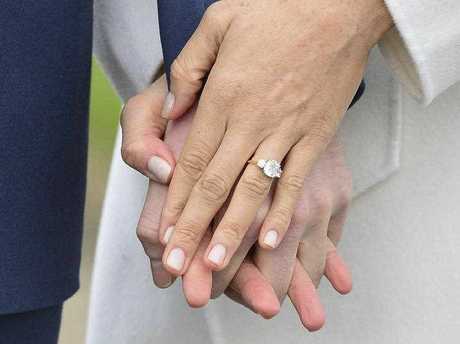 "Like her mother, the Duchess of York and indeed Princess Diana, Eugenie's ring has a centre oval precious gemstone and this one certainly has not disappointed," gemologist Deborah Papas, of Prestige Pawnbrokers, told The Sun. "It is a padparadscha sapphire surrounded by 10 brilliant cut diamonds and two pear cut diamonds to give an edge to the standard classic cluster. "Padparadscha is the name given to the corundum gem that bears a mixture of red and yellow, a sort of cross between a ruby and yellow sapphire. "This beautiful gem is considered amongst the rarest and most valuable of all the corundum varieties. "With its carefully faceted cut and the set off with the whitest of white diamonds, this ring could easily be worth over £100,000. "Padparadscha sapphires are amongst the rarest and most valuable depending on quality and a little bit of difference in quality can mean a big difference in price. Deborah admitted that estimating such a valuable gem was difficult without full sight. The Princess has dated the 31-year-old party organiser for six years and her parents, the Duke and Duchess of York, said they were delighted with the engagement news. Royal insider Dickie Arbiter says the Princess's marriage to the 31-year-old will be even more star-studded than Meghan's.